God’s design is for Mary’s husband, the just man of the house of David, to continue with their plans to form a home together, and to name and act as father to the child conceived by the Holy Spirit. The Son of God depends upon a chosen human father, committed in a virginal marriage, to provide a loving, caring, and wholesome home for him. 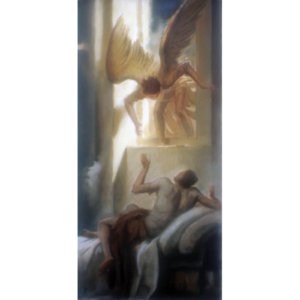 Fathom Joseph’s reverent awe at the angel affirming his mission as husband to the Mother of God and earthly father to the Son of God. Picture young Joseph and Mary coming to live together as pure spouses to provide a family for the Son of God to be born to them. Imagine how God’s overwhelming love for them so deepens their love for each other. With the Holy Spouses reverence the mystery of God coming to us as the Messiah in Mary’s womb. Mary, full of grace, and Joseph, son of David; honor to you, Mother of God, and to you, guardian of the Redeemer. Eternal praise to the child with whom you formed a family, Jesus the Messiah.